The coat of arms of Karelia, first used in 1562. Karelia (Finnish: Karjala, Swedish: Karelen) is an historical province of Finland which Finland partly ceded to Russia after the Winter War of 1939–40. The Finnish Karelians include the present-day inhabitants of North and South Karelia and the still-surviving evacuees from the ceded territories. Present-day Finnish Karelia has 315,000 inhabitants. The more than 400,000 evacuees from the ceded territories re-settled in various parts of Finland. Finnish Karelia historically came under western influence, religiously and politically, and was separate from East Karelia, which was dominated by Novgorod and its successor states from the Middle Ages onwards. Approximate area of historical Karelia compared to borders of modern-day Finland. Drawing of Karelian Iron Age sword hilts by Theodor Schwindt made in 1893, which he had excavated earlier in Käkisalmi. First indications of human settlement in Karelia are from the Mesolithic period. The oldest find from the area is the over 9000 years old Antrea Net which is a fishing net of willow bast. The number of finds from the area is lower towards the end of the Stone Age. Archeological finds from Karelia are relatively rare between the years 400-800. From the Merovingian period onwards finds from Karelia display a distinct features of West Finnish influences which has been interpreted to result at least partly from a colonisation. At least 50 sites of Iron Age settlements and 40 hillforts are known from Karelia. According to archeological record and historical data most of the hillforts in Karelia were erected between 1100 and 1323. Particular Karelian culture including axes, brooches and ornamental culture flourished approximately between the years 1000-1400. During the 12th and 13th century, Karelians fought against Swedes and other Finnic tribes situated in western Finland, such as Tavastians and Finns proper. Karelians were listed as Novgorodian allies in the mid-12th century in Russian Chronicles. Historical records describe Karelians pillaging Sigtuna in Sweden in 1187 and making another expedition in 1257 which lead Pope Alexander IV to call out a crusade against Karelians at the request of Valdemar, the king of Sweden. The Third Swedish crusade, led by the marshal Torgils Knutsson took place between 1293 and 1295. As a result of the crusade the western parts of Karelia fell under Swedish rule and the building of the Castle of Viborg on the site of destroyed Karelian fort started. According to Eric Chronicles invading Swedes conquered 14 hundreds from Karelians during the crusade. Hostilities between Novgorod and the kingdom of Sweden continued in 1300 when a Swedish force attacked the mouth of the River Neva and built a fort near the current location of Saint Petersburg. The fort was destroyed the following year by the Novgorodians. Indecisive fighting in 1321 and 1322 led to negotiations and peace by the Treaty of Nöteborg which for the first time decided the border between Sweden and Novgorod. Sweden got territory around Viborg, the western Karelian Isthmus and South Karelia; and Novgorod got the eastern Karelian Isthmus, Ingria, Ladoga Karelia, North Karelia and East Karelia. In 1617, Sweden seized Kexholm County (eastern Karelian Isthmus, Ladoga Karelia, and North Karelia) from Russia. In 1634 Savonia and old Swedish Karelia were incorporated in the Viborg and Nyslott County. After the Treaty of Nystad in 1721 eastern parts of the Viborg and Nyslott County and the Kexholm County were ceded to Russia. The rest of these counties were incorporated into the Kymmenegård and Nyslott County. The southeastern part of this county was also ceded to Russia in the Treaty of Åbo of 1743. After the conquest in 1809 of the rest of Finland, Russia's 18th century gains, called "Old Finland", were in 1812 joined to the Grand Duchy of Finland as a gesture of good will (see Viipuri Province). A large part of Finnish Karelia was ceded by Finland to the Soviet Union in 1940 after the Soviet aggression known as the Winter War, when the new border was established close to that of 1721. During the Continuation War of 1941-44, most of the ceded area was liberated by Finnish troops, but in 1944 was occupied again by the Red Army. After the war, the remains of the Province of Viipuri were made into the Province of Kymi. In 1997 the province was incorporated within the province of Southern Finland. Western Karelia, as a historical Province of Sweden, was religiously and politically distinct from the eastern parts that were under the Russian Orthodox Church. Following the dissolution of the Soviet Union, the long-silenced debate over returning Karelia from Russia to Finland resurfaced in Finland. Drawing of a Karelian Iron Age knife with a sheath made by Theodor Schvindt in 1893 illustrating the one he excavated in Käkisalmi, Karelia. Finnish Karelians are considered as a regional and cultural sub-group of the ethnic Finns. They speak the eastern or south-eastern dialects of the Finnish language. The Finnish Karelians include also people of East Karelian origin or roots, but these have been linguistically and ethnically assimilated with closely related Finns after the Second World War. However, the Orthodox religion is still maintained by many Finnish Karelians with East Karelian background, especially in North Karelia; the majority of the Finnish Karelians are predominantly Lutheran. 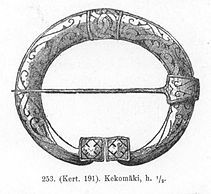 Drawing of a Karelian Iron Age silver penannular brooch by Theodor Schvindt in 1893. The dialect spoken in the South Karelian Region of Finland is part of the South Eastern dialects of the Finnish language. The dialect spoken in the Karelian Isthmus before World War II and the Ingrian language are also part of this dialect group. The Karelian language, spoken in East Karelia, is very closely related to the Finnish language. The dialect that is spoken in North Karelia is considered to be one of the Savonian dialects. Lauri Törni, born in Viipuri, Törni was a soldier and winner of the Mannerheim Cross during the Continuation War, who later served with the German and American armies. The arms is crowned by a ducal coronet, though by Finnish tradition this more resembles a Swedish count's coronet. The symbolism of the coat of arms is supposed to represent how the region was fought over by Sweden and Russia for centuries. Blazon: "Gules, in center chief a crown or above two duelling arms, the dexter armored holding a sword and the sinister chain-mail armored with a scimitar, all argent except for hafts and gauntlet joint or." ^ Uino, Pirjo (1997). Ancient Karelia. Suomen muinaismuistoyhdistyksen aikakausikirja 104. pp. 102–113. ^ Uino, Pirjo (1997). Ancient Karelia. Helsinki: Suomen muinaismuistoyhdistyksen aikakausikirja 104. pp. 45 and 72. ^ Uino, Pirjo (1997). Ancient Karelia. Suomen muinaismuistoyhdistyksen aikakausikirja 104. p. 83. ^ Uino, Pirjo (1997). Ancient Karelia. Helsinki: Suomen muinaismuistoyhdistykse aikakausikirja 104. pp. 166–171. ^ Kacowicz, Arie Marcelo; Pawel Lutomsk (2007). Population Resettlement in International Conflicts. Lexington Books. pp. 58–60. ISBN 978-0-7391-1607-4. This page was last edited on 25 January 2019, at 07:11 (UTC).